Blaine Francis Nye (born March 29, 1946) is a former American football player, an offensive lineman in the National Football League for nine seasons with the Dallas Cowboys. 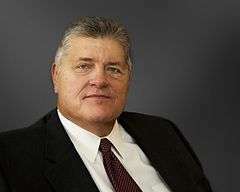 He was later the founder and president of Stanford Consulting Group, Inc., a firm specializing in economic research. Born in Ogden, Utah, Nye played football at Servite High School in Anaheim, California, and graduated in 1964. He played college football at Stanford University. As a sophomore in 1965, he played offensive tackle and defensive end. The next season he was moved to defensive tackle, led the team with 104 tackles and received honorable-mention All-Pac-8 honors. As a senior in 1967, he made All-AAWU Athletic Association of Western Universities Honorable-Mention, while earning a B.A in physics. He also played rugby. He was inducted into the Stanford Athletic Hall of Fame, the Stanford All-Century football team and to the Orange County Sports Hall Of Fame. Nye was selected by the Dallas Cowboys in the fifth round (130th overall) of the 1968 NFL/AFL draft as a defensive tackle. During the 1970 season, with the Cowboys needing help on the offensive line, he was switched to offensive guard and replaced John Wilbur. He played right guard between Hall of Famer offensive tackle Rayfield Wright (1970–1976) and Dave Manders (1970–1972) or John Fitzgerald (1973–1976) at center and helped anchor a dominant offensive line that led the Cowboys to three Super Bowls. He played in 125 games during his nine-year career with the Cowboys, including the three Super Bowls and two Pro Bowls. Nye retired at the end of the 1976 season (after the Pro Bowl in January) and was replaced by Tom Rafferty. "Offensive linemen are like salt. Nobody ever remembers the brand they buy." After Clint Longley's famous comeback win over the Washington Redskins on Thanksgiving Day in 1974, a reporter asked him what the game meant, his answer was "This game represents the triumph of the uncluttered mind." During the offseason, Nye earned a M.S. in physics from University of Washington in Seattle in 1970 and an M.B.A. from Stanford University in 1974. After retiring from football in 1976, he earned a Ph.D. in finance from Stanford in 1981. His dissertation was titled "Demand and Pricing for Health Care and Guaranteed Insurability". In 1981, Nye founded Stanford Consulting Group. Inc. He performs numerous economic analyses and research, and provides expert testimony in multiple areas including securities litigation, intellectual property, business litigation, damages, and insurance economics. 1 2 "Blaine Nye". Anaheim, California: Servite High School. Alumni Spotlight. Retrieved March 8, 2016. ↑ Noland, Dave (November 19, 1990). "Physics and football were his fortes". Sports Illustrated: 140. ↑ Buttram, Bill (January 3, 1973). "Wilbur gets his revenge". Free Lance-Star. Fredericksburg, Virginia. p. 8. ↑ Chick, Bob (October 4, 1977). "To be dull is the thing". St. Petersburg Independent. Florida. p. 1C. ↑ "Cole steps into limelight with retirement". The Bulletin. Bend, Oregon. UPI. March 28, 1981. p. 24. ↑ Macelli, Dawn (June 30, 2015). "Cowboys Memories: The Zero Club". Blogging the Boys. Retrieved March 8, 2016. ↑ "Stanford GSB Athletic Champions". Stanford Business. Fall 1980. Retrieved March 8, 2016. ↑ "Experts". Stanford Consulting Group. Retrieved March 8, 2016. Wikimedia Commons has media related to Blaine Nye.